Elastomeric Roof Coatings Provide Superior Energy Efficiency! Is your commercial roofing system aging and in need of several repairs? You might be able to avoid a replacement, and choose roof restoration instead! Roof restorations are a fantastic alternative to the invasive and expensive nature of a roof replacement, for more reasons than one! To begin, roof restorations can save time and money, but an added bonus is that your roof restoration has a much smaller impact on the environment. One of the best roof restoration options on the market is known as an elastomeric roof coating. Our elastomeric roof coatings in Texas, Louisiana, and Mississippi are not only affordable, but also a great way to address minor and major problems with your current roofing system. How Do Elastomeric Roof Coatings Work? The Roof Coating Process Is Fast And Simple. Elastomeric roof coatings represent the number one choice in roof restoration and come in a few different varieties. Phone us at (833) 200-0571 if you have any queries or requests about elastomeric roof coatings in Texas, Louisiana, and Mississippi. 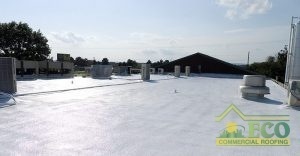 At ECO Commercial Roofing, we are always pleased to answer questions and are ready to cater to your next restoration job. You should acquire a variety of choice advantages when you choose to have roof restoration or a coating applied. Installation directly on top of your existing roofing represents one benefit. This means you preserve money right away, as removing and disposing of an aged roof can be very expensive. Because roof debris takes such an extended time to break down, they may present a substantial encumbrance for landfills. The simple application process and the lower cost of elastomeric roof coatings also present significant advantages. Manufactured with resilient polymers, elastomeric coatings are a great method to perform minor repairs, as well as waterproof an entire roofing system. A reduction of energy bills will additionally take place if you have applied a white elastomeric roof coating. If you have made the choice to recover your roof with elastomeric roof coatings in Texas, Louisiana, and Mississippi, give us a ring at (833) 200-0571 to start the service. 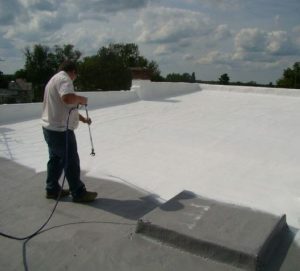 We provide several roof coating choices, including silicone, acrylic, and polyurea to choose from, and you can count on our expert technicians to help you select the perfect coating answer for your needs and budget.